Initiative 300, the "Right to Survive" ballot issue, will show up on Denver ballots during the municipal election on May 7. Normally, a Truth Test would focus solely on the claims made in an advertisement, statement or mailer, but this Truth Test has to do double duty. First of all, what is "300?" Initiative 300, the "Right to Survive" ballot issue, will show up on Denver ballots during the municipal election on May 7. Those ballots get mailed out on Monday. A YES vote on 300 would allow people to sleep in public spaces, like parks and sidewalks, as long as the sidewalk is not made impassible. People would be able to eat, share or accept food in a public space. They would also be able to occupy a legally parked vehicle and have an expectation of privacy. A NO vote keeps Denver's camping ban in effect. Denver Police and Denver Public Works would be able to ask people to leave public spaces and sweeps of camping areas could continue. The yellow mailer that is being delivered this week makes multiple claims under the header "A Yes Vote will:"
CLAIM: Allow people to occupy ALL outdoor public places, including parks and sidewalks indefinitely. VERDICT: This is true, but with a few caveats. You couldn't block the sidewalk, it would still have to be passable. Indefinitely is true, but it could be changed with another vote of the people, or by city council. Denver City Council can amend or repeal an initiative, but not until six months have passed. Between six months and 10 years, city council can amend or repeal it with two-thirds council vote, but only after holding a public hearing. CLAIM: People can camp on ALL public property adjacent to private residential and commercial buildings, sidewalks, alleys, public parks, medians and plazas. VERDICT: True. Public space is public space. Though, the ordinance is not fully clear on what would happen if someone is blocking a right-of-way, like an alley. CLAIM: Allow people to camp in all outdoor public places, like parks and sidewalks, indefinitely. Again, this requires the sidewalk to be passable and indefinitely is as long as voters or city council doesn't change the law. CLAIM: Prohibit city agencies and law enforcement from enforcing essential laws that protect public health and safety. VERDICT: This is an overstatement. If there were visible drug use, illegal activity or unsanitary conditions, police would be able to enforce health and safety laws. CLAIM: Eliminate all park curfews. In the Denver version of the Blue Book, the "Yes on 300" side claims "Parks after curfew will not be accessible." The "No on 300" side claims "It would end park curfews." So, which is it? The short answer is, a court will likely have to decide. "Shall the voters of the City and County of Denver adopt a measure that secures and enforces basic rights for all people within the jurisdiction of the City and County of Denver, including the right to rest and shelter oneself from the elements in a non-obstructive manner in outdoor public spaces, to eat, share accept or give free food in any public space where food is not prohibited, to occupy one's own legally parked motor vehicle, or occupy a legally parked motor vehicle belonging to another, with the owner's permission, and to have a right and expectation of privacy and safety of or in one's person and property?" The actual text of the initiative is about three pages long. "It shall be unlawful for the City and County of Denver to enforce any ordinance, resolution, regulation, rule or policy that limits, prohibits or penalizes the rights secured by this ordinance." That could mean the park curfew ordinance would not supersede the rules of 300. A judge will likely have the final say, if 300 passes. CLAIM: Parks will be campgrounds forever! VERDICT: This is misleading. The mailer should have stuck with the word "indefinitely." Forever is misleading because the policies of 300 can be changed by another vote of the people of by city council, as stated above. CLAIM: Your front doorstep could be a campground forever! Your front doorstep is private property. That would be trespassing. However, the sidewalk in front of your home, is public, and would be OK as long as the sidewalk was not impassible. Again, forever is misleading. CLAIM: Parking spaces directly in front of your home could be a campground forever! If the parking space in front of your home is a public street and the city allows parking, then yes it would be legal under 300. If the parking space in front of your home is your driveway or a private parking lot, this would not be legal. Again, forever is misleading. It includes a quote from the Denver Homeless Leadership Council in opposition to Initiative 300. At the very bottom of the mailer, it states: "For more information, contact www.togetherdenver.com. Here's the thing, Together Denver, which is against Initiative 300, didn't produce the mailer. 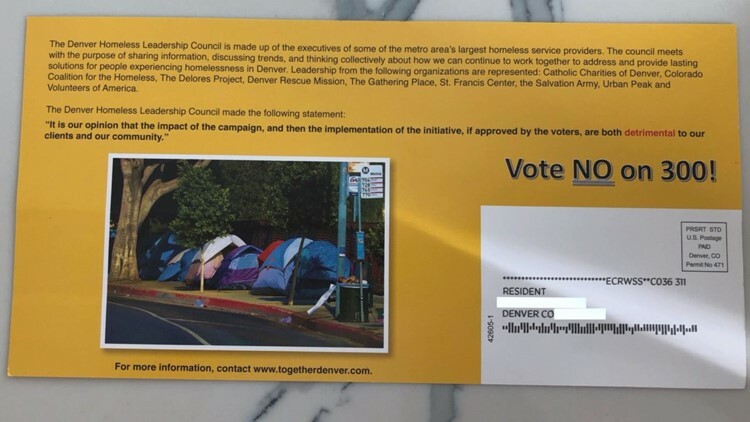 The Denver Homeless Leadership Council and all those entities listed above also had nothing to do with the mailer. "The HLC is not affiliated with the proponents or opposition campaigns," the Denver Homeless Leadership Council said in a statement. "We were surprised to receive it just like everyone else across the city," said Roger Sherman, campaign manager for Together Denver. "If you notice, it does not have our disclosure." The materials produced by Together Denver say, "Paid for by Together Denver." "I don't think it's damaging, there are some lines on the postcard that are a bit of a stretch, frankly, and we have tried very hard to authentically and accurately characterize our concerns about the initiative. "We would appreciate folks who are trying to help us, to let us do our jobs," said Sherman. Denver Elections could investigate this mailer since it does not have the proper disclosure, but it would require a complaint. "I think it's too early to tell what exactly we might or might not do. We'd like to figure out who sent it first and go from there," said Sherman. He said they are using their own mail house to see if there are numbers or codes on the mailer that can used to identify who did send the mailer. "There are permit numbers, and things like that, that they can utilize to try to track down who paid for the mail," said Sherman. A spokesman for the U.S. Postal Service told 9NEWS privacy precludes revealing who is sending the mail, but that we could file an open records request. The mailer also comes with two photos. The image on the front appears to be of the Colorado Springs Rescue Mission, taken by a Colorado Springs Gazette photojournalist on Oct. 12, 2016. The image on the back was snapped on July 8, 2018 in Los Angeles, Calif.
BOTTOM LINE: The mailer includes some truthful statements, but is peppered with fear-language and overstatements that this will be forever, as well as that one false line about your front doorstep. It's also suspicious because we cannot tell you who is responsible for it. 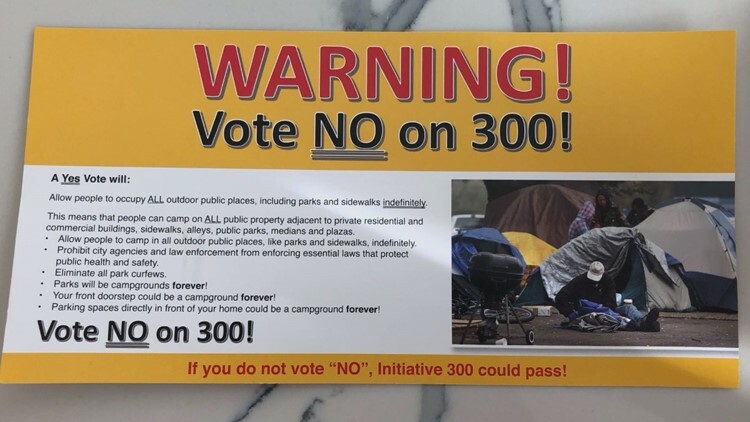 Yes, public spaces will be impacted by the passage of 300, this mailer makes some bold statements that might not be realized even if 300 were implemented.